A Year of Being Here: Lynn Ungar: "Camas Lilies"
into acres of sky along the road. oblivion as the flowers fell? from their tender blue eyes. Even in sleep your life will shine. your work will always matter. was not arrayed like one of these. "Camas Lilies" by Lynn Ungar, from Blessing the Bread: Meditations. © Skinner House, 1995. Presented here as posted on the poet's website. 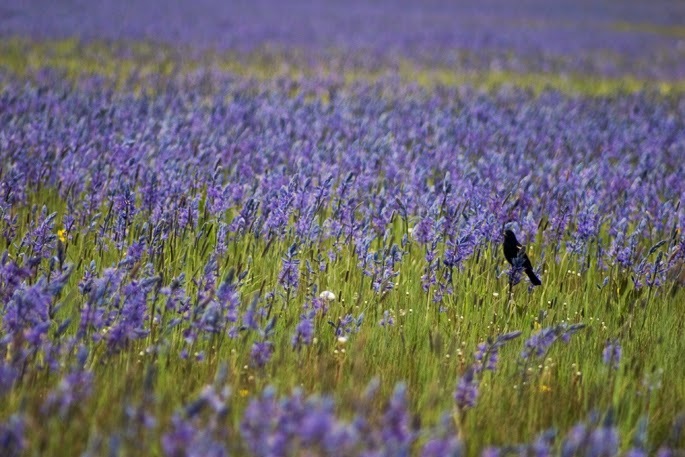 Art credit: "A red winged blackbird among spring camas blooms," photograph by Greg Stahl. My favorite lines from the poem. W. S. Merwin: "By the Front Door"
Marge Piercy: "The Art of Blessing the Day"
Bronislaw Maj: "An August Afternoon"
Joyce Sutphen: "The Book of Hours"
Alice N. Persons: "The Perfect Day"
Gary Lawless: "Treat Each Bear"
Barbara Crooker: "Walking with Jesus"
Nathaniel Tarn: "Before the Snake"
David Allen Sullivan: "Permission Granted"
Miguel de Unamuno: "Throw Yourself Like Seed"
Anita Barrows: "Lessons from Darkness"
Robert Bly: "People Like Us"
Barbara Ras: "You Can't Have It All"
John O'Donohue: "For Love in a Time of Conflict"
Osip Mandelstam: "A Body Was Given to Me"